The next great technology? Or the annoying chat screen? 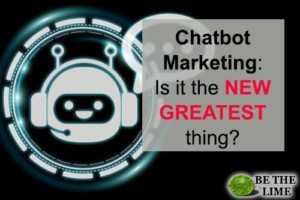 What’s up with Chatbot Marketing? They are smarter, faster—and they learn. But, what is a Chatbot? A Chatbot is a computer generated program that mimics intelligent conversation. It can act as a stand-alone program or can be combined with an actual human to answer more complex questions. Not only can they answer questions, they can offer personalized shopping experiences and generate worth-it leads. And they learn. The more they chat, the more knowledge they gain. The longer they are around, the smarter and more efficient they get. This means, one day, they will be more than an interactive FAQ section. Bottomline: They are still computers. 9/10 people say personalization impacts their buying decisions. Imagine being greeted by name with suggestions tailored to you. Chatbot integrates with social media and pulls from search histories to create a personalized shopping experience. This is where discretion comes in. It’s like when you have stalked your blind date on social media so thoroughly that you know their employment, their sister’s boyfriend’s name and what type of car their dad drives. You don’t always want to lead with that. Same goes for finding out all that information from your customer. Will they enjoy the experience? Or will the run for the hills screaming? You also need to tell them they are talking to a bot. It is on them if they forget this fact, but it’s on you to make the information available. The fact is….we want it, and we want it now. It doesn’t matter what “it” is. We still want it, and want it now. Same goes for when we ask questions. It does not matter if it is at 2pm or 2am, we demand answers. In fact, 51% of consumers expect businesses to be able to field questions 24/7 (sorry Chick-fil-A, Sunday is required). Enter Chatbot. While you sleep, chatbot can answer. It also eliminates the need for someone to continually check the Contact Us Forms and Social Media (if that is where your Chatbot is). If you are a small business, this is a big plus. It frees someone up to do other things—like deliver on promises and ship sold items (you know the things that make you money). Aaaah the American dream. Make money while you sleep. In actuality, if is taking away the need to hold someone’s virtual hand while they shop your website, it could be a good thing. You know the customer. The one that needs a million questions answered before deciding they really need to see the product in person before they can decide. Chatbot can help that person, removing you from the time-sucking-experience. H&M also put their Chatbot to work to help online customers purchase items that were right for them. They asked a series of questions until their computer mind came up with the appropriate item of clothing for their needs. This may be one of the best functions of Chatbot Marketing. Instead of having one employee sift through potential leads for 8 hours to only gain 3 sales—Chatbot can do it. Chatbot can identify quality leads from non-quality leads. Freeing up your employee to work on promising leads. Start finding the patterns and start creating more personalized email marking and lead marketing techniques. But, seriously. Keep it really simple. Chatbot’s are new and with any new and “improved” technologies, come a lot of gliches. Chatbot’s are great when they stay in their wheelhouse. Make things too complicated and they short-out. Giving you a bigger headache than when you started. Chatbot’s need one clearly defined purpose. Are they answering questions at all hours? Are they pushing personalized sales ideas? Are they getting you leads? While eventually they may be able to do all of these, at once, and seamlessly—we aren’t there yet. If it works, it works. If you look at Chatbots and think, “Wow! This is exactly what I have been looking for!” than Congrats: you have found your next marketing move. If they aren’t for you, we bet you can find something better for your money. Just because the world is doing it, doesn’t mean you have to be sold on the idea and derail your plans to make it fit.